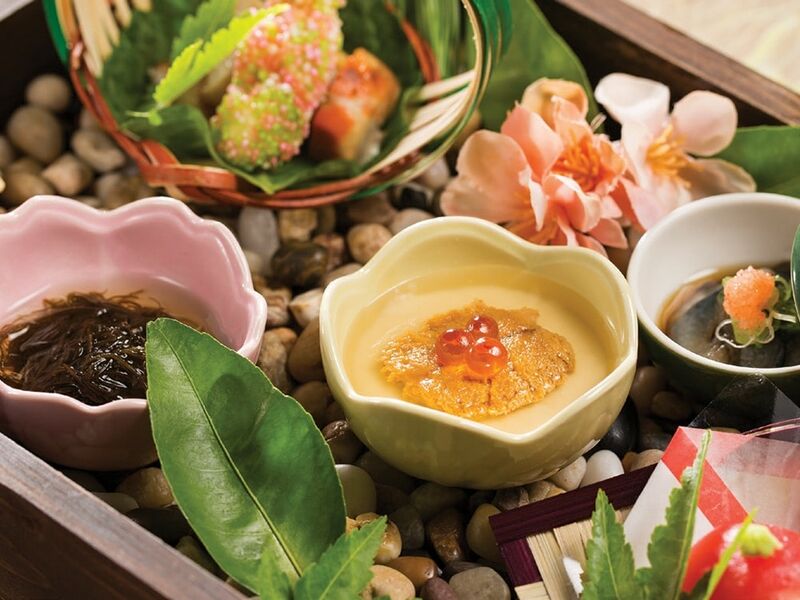 Kaiseki Yuzu offers a one-of-a-kind Japanese dining experience days in the making. Chef Kaoru Azeuchi is all business in his kitchen, but you can see him smiling when someone yells “Wow!” in the dining room. That’s the intended reaction on this night, when customers are getting a taste of the chef’s kaiseki menu at his Silverado Ranch restaurant, Kaiseki Yuzu. “Amazing,” chef Azeuchi explains through his interpreter, restaurant stylist Martin Koleff. “For many, it’s the first time they’ve ever eaten something like this, because in the United States there’s not many people who can perform a course like that. For the uninitiated, kaiseki is not a food or dish, but a varying presentation of nine to 10 dishes prepared hot and cold, and delicately arranged in a manner that brings out that “Wow!” feeling, even if the ingredients don’t necessarily go together. The origins of kaiseki date back to the 16th century—a cuisine served as part of a tea ceremony that has evolved into modern-day kaiseki. The name translates to “stone in bosom” or “stone in stomach,” which refers to monks putting hot stones in their robes in order to stave off hunger. Modern kaiseki is a meal prepared by a skilled master, one who, like Azeuchi, wakes up early in the morning to prepare dishes that will be served later that evening. Priced at $100 and more per person, the chef’s kaiseki arrangement—at least according to one recent menu—begins with an appetizer paired with sake, followed by a sashimi dish, grilled and steamed dishes, a small hot pot, yosenabe (a hot pot), tempura, a vinegar dish (to cleanse the palate, according to Azeuchi), sushi, soup and dessert. The lengthy preparation period has guests reserving their seats days in advance for the kaiseki menu, while Azeuchi is amassing a fan base akin to celebrity chefs on the Las Vegas Strip. Even guests who leave glowing reviews on Yelp admit they don’t want to share the “hidden gem” they’ve discovered. When those guests arrive, they’re likely to do a double take after spotting Kaiseki Yuzu’s sign above the door. The restaurant—about 20 to 30 minutes from the Strip—sits at the end of a small shopping plaza, sandwiched between auto parts and tire retailers. Inside there are fewer than 30 seats, with a short bar and no waiting area. Understated? Without question, but as fans have pointed out, chef Azeuchi is the reason they come so far. 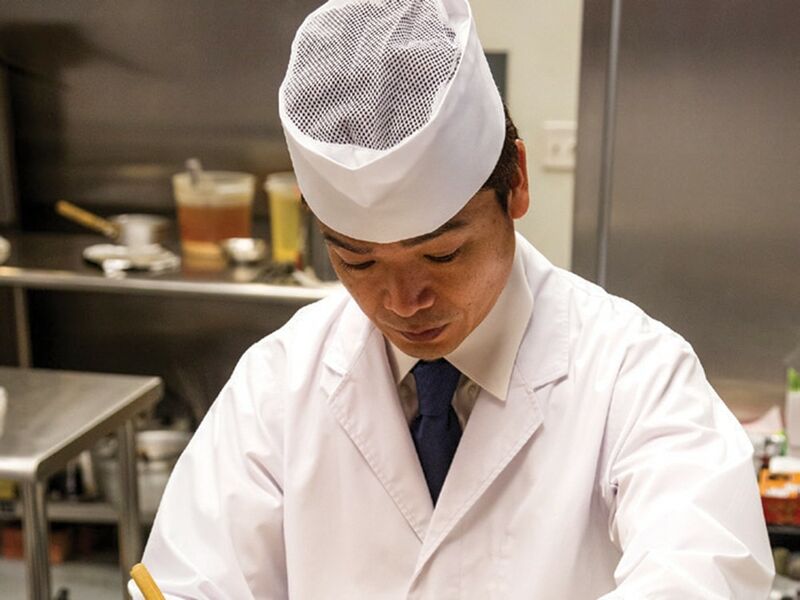 His bio touts 16 years of experience as a kaiseki chef in Japanese hotels, where the meal is commonly served in high-end restaurants and at large family gatherings. “In Japan, to become something of his level, it takes 10 to 15 years,” Koleff translates. When asked about opening Kaiseki Yuzu in 2014, chef Azeuchi says that it had always been his dream to come to the U.S., but he didn’t expect to end up in Las Vegas.